During the 2015 ARO Ear Research conference, Hyperacusis Research sponsored a workshop to build a roadmap to find a cure for hyperacusis. 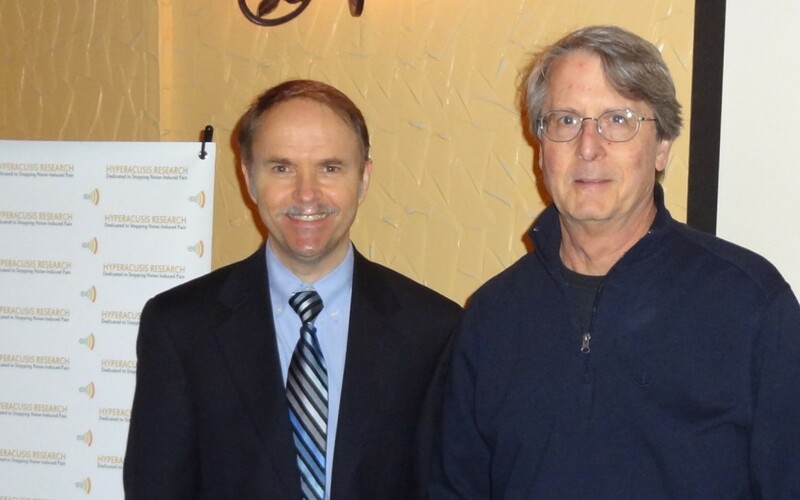 The dinner event, attended by 27 people, included some of the nation’s top otology researchers such as Charles Liberman (pictured at left with Bryan Pollard), Professor of Otology and Laryngology, Harvard Medical School; Richard Salvi, Clinical Professor of Otolaryngology, SUNY Buffalo; and Paul Fuchs, Bordley Professor and Director of Research, Otolaryngology–Head and Neck Surgery, Johns Hopkins University School of Medicine. Bryan Pollard, President of Hyperacusis Research, kicked off the event with an overview of our nonprofit’s effort, including our fundraising and grant history. A key aspect of the mission is to connect researchers directly with those affected by the condition. To facilitate this goal, Bryan introduced four stories from hyperacusis sufferers and relatives filling in for their loved ones who were too injured to travel to tell their tales. The heart of the event was defining the key research effort needed to develop a cure. Fourteen researchers helped develop the guide, which is shown below with the key details. Three researchers put together the information for this section. 1. Hyperacusis definitions vary in published literature. Two example definitions are: Abnormally strong response to moderate sound; Abnormal reactions to sound, including excessive loudness, annoyance, fear and pain. 2. How is hyperacusis identified in people? Questionnaires, case history, Loudness Discomfort Levels (LDL’s), and Loudness Growth Functions. For LDL’s, some classify hyperacusis patients with LDL’s below 90dB, others at 70dB LDL while severe hyperacusis is defined by some at 60 dB LDL. 3. How is hyperacusis identified in animals (for animal models)? Acoustic Startle Reflex, Reaction Time, and Two-alternative forced choice. 4. Epidemiological studies in the general population are insufficient. 1. Better sub-typing of hyperacusis patients (perhaps building from the 4 identified subcategories: loudness, annoyance, fear and pain. 2. Better standards for LDL testing along with categorization of hyperacusis severity and objective tests such as startle reflex. 3. Improved animal models addressing pain and other components of hyperacusis. Also there is a need for animal model metrics that can also be used in humans (such as reaction time). 4. Epidemiological studies are needed to determine the prevalence of hyperacusis in the general population. Hyperacusis Research hopes to address some of these needs with a detailed hyperacusis patient survey which will be conducted in 2015. Charlie Liberman (pictured) led this topic in an effort to identify changes in cellular and neural populations leading to hyperacusis with pain. While it has been historically accepted that the cochlea (inner ear) does not have a pain sensory mechanism, recent discoveries have suggested that there are pain nerve fibers that likely send pain signals to the brain under certain conditions. Virtually all of ear research has been based on the main auditory nerve fibers (known as Type I) that send noise signals to the auditory parts of the brain from the Inner Hair Cells. It has been known for some time there was another type of nerve fibers (known as Type II) which are largely connected to the Outer Hair Cells but their function has been unknown. Recent work has shown that these Type II fibers are sensory mechanisms for pain (details outlined in diagram below). As a basic scientist, Paul Fuchs (pictured) has been studying these Type II fibers extensively and recently proved that the fibers can be excited under certain tissue damaging conditions (such as those that can occur from very loud noise exposures). These concepts open up a whole new dimension of research and leave many open questions in relationship to hyperacusis. How can we validate that these Type II fibers are activated in hyperacusis cases? What would cause the reactivation of these pain fibers at lower noise levels once someone has hyperacusis? Finally, what could be done to contain or stop the activation of the pain fibers that play a role in hyperacusis? To answer these types of questions for Type II pain fibers, good animal models are needed. Amanda Lauer proposed the following for animal model studies: acoustic startle reflex, grooming, grimacing, and changes in home cage behavior. Some additional concepts covered in this section on possible mechanisms are covered below. James Kaltenbach discussed research showing that outer hair cell loss in animals can trigger hyperactivity in the dorsal cochlear nucleus. Experiments also showed that following intense sound exposure there is a significant increase in the acoustic startle reflex. These changes suggest an increase in central gain in the auditory pathways of the brain. The enhanced acoustic startle response may be part of a broader spectrum of changes that include the more common symptoms of hyperacusis. Marlies Knipper (pictured) continued to build on these concepts by showing work completed by her team which generates behavioral animal models for hyperacusis and tinnitus. The behavioral trainined animal models exhibit loudness versus sound intensity curves for normal ears, hearing loss, hyperacusis, and tinnitus predicted in computerized models by Fan-Gang Zeng in Hearing Research, 2013. In behavioral models for hyperacusis, the perceived loudness for given low levels of sound intensities was normal while perceived loudness is greater than normal for greater sound intensities. In the animal models for tinnitus, the perceived loudness for given low levels of sound intensities was elevated even without sound, while perceived loudness was normal for greater sound intensities. Knipper’s lab is now able to investigate the molecular basis of phenotype differences within the ascending auditory and limbic pathway including suprathreshold auditory brainstem response (ABR) tests and various neural measurements including nerve ribbon fiber counts. Finally Marlies Knipper proposed more exploration of the impact of type II fibers (discussed previously by Liberman and Fuchs) and its possible role in the observed central hyperactivity. Kelly Radziwon covered a few of the options currently used to measure loudness hyperacusis in animal studies. A key method uses reaction time (time to respond to a given sound). Supporting data demonstrate faster reaction times for animals with hyperacusis. This methodology is interesting because it is potentially transferrable to be used in human subjects. Additional plans are being developed for this type of testing at a audiology clinic at the University at Buffalo. Kelly also described a 2-alternative forced choice operant conditioning procedure that can be used in animal studies but requires substantial training. Craig Formby (pictured) introduced Path C discussing the Development and Optimization of Therapies for hyperacusis. In his summary Dr. Formby referenced the following current therapies and noted in discussing severe cases of hyperacusis with pain that more research is needed for measuring effectiveness of each therapy. 1. Counseling / Cognitive Behavioral Therapy – Usually combined with sound therapy. 2. Hyperacusis Activities Treatment and Social Support – Important for Misophonia. 3. Medications – Limited case studies have shown some benefit for Alprazolam (short-acting anxioltic) (Johnson et al., 1993), Carbamazepine (anti-convulsant/mood stabilizer) (Nields et al., 1999), Fuvloxamine/Fluoxetine (serotonin inhibitor) (Gopal et al., 2000), Citalopran (serotonin inhibitor). Chronic Electrical Stimulation of the Auditory Cortex for Intractable Tinnitus, rTMS for the Treatment of Chronic Tinnitus: Optimization by Simulation of the Cortical Tinnitus Network (Multisite rTMS), Conventional Repetitive Transcranial Magnetic Stimulation for Tinnitus , and The Effect of Transcranial Direct Current Stimulation (tDCS) in Addition to Tinnitus Retraining Therapy (TRT) for Treatment of Chronic Tinnitus Patients. Continuous Low-Level Broadband Noise: Implemented with chronic use of bilateral sound generators per desensitization protocol described by Hazell & Sheldrake in 1992. Tinnitus Retraining Therapy: Combines Hazell & Sheldrake’s sound-therapy protocol combined with Jastreboff’s neurophysiological model and counseling principles. Desensitization/approximation approach to high-level broadband (pink) noise: Patient is exposed to progressively higher level sounds toward enhancing comfort and tolerance for higher sound levels from Vernon & Press, 1998. Loudness suppression: An application of extreme amplitude compression in an ear-worn device; some benefit seen for severely debilitated hyperacusis patients; advocated by Sammeth (2000) as an aid to facilitate TRT-based desensitization therapy. Neuromonics: Music-based treatment approach, including counseling, calling for repeated-sessions of listening to proprietary stimulation over weeks to months; Davis (2007) reported enhanced LDLs and sound tolerance in tinnitus patients. Tailored Sound Therapy: Repeated daily listening sessions (~1-2 hrs, over a period of a few weeks) to a temporally complex, band-limited stimulus have been reported by Norena & Chery-Croze (2007) to improve the sound intolerance of tinnitus patients with hyperacusis. Formby stated that randomized controlled trials (RCTs) are needed to evaluate efficacies of sound therapies for hyperacusis. Formby (in press, 2015) reported clinically significant expansion of the auditory dynamic range and enhanced sound tolerance among hearing-impaired persons with mild hyperacusis in a randomized, placebo-controlled, randomized clinical trial of a protocol implemented with counseling and low-level broadband sound generators. Susan Gold added additional information from her work at the University of Maryland Tinnitus & Hyperacusis Center. A key learning from her work is the clinical intake form which included some helpful questions on pain and the conditions under which pain persists. For example, does the pain only exist during a noise exposure or does it linger after the noise and how long does linger. Susan Gold’s experience showed that patients who had pain linger until the next day were more severe than those who recovered by the next day and the treatment approach would be more extensive. Dr. Mickra Hamilton (pictured) was unable to make the event but sent a brief summary of her work on Taming the Autonomic Nervous System (ANS) as practiced at the Synchronicity Wellness Center. The physiological symptoms of ANS are addressed first followed by neurofeedback after physiologic stress markers have improved, such as increased heart rate variability coherence. Auditory treatment includes custom communication devices that deliver therapy and also serve as hearing protection. Soundscapes are generally nature based with embedded heart rate variability breath pacer tones specifically designed based on audiometric findings. Breath paced tones are based on individual resonant heart rate variability frequencies obtained during the psychophysiologic profile. Custom Musician plugs with multiple filters are also standard. 1. Sound Therapy – Expand on current white noise approaches to more patient specific approaches. 2. Migraine Related Conditions – Explore Triptans or similar medications. 3. Demyelinating disease-Interferon – Interferon-alpha (IFN-alpha) is used as treatment for HCV infection which coincides with disease in the central and peripheral nervous system. Explore application of this approach to possible auditory neural damage in hyperacusis cases. 4. Superior canal dehiscence-Surgery – In Superior canal dehiscence, the temporal bone is thinned and results in various symptoms including hyperacusis. Better categorization of hyperacusis patients could show some may have this problem which can be resolved by surgery. 5. Associated Pain Syndromes – The science of pain management includes many new developments which could be explored for application in the most severe cases of hyperacusis with pain. Professor Salvi also pointed out the need to prevent relapses by avoiding loud exposures as well as the need for better noise regulation and education. Brozoski, T.J., Caspary, D.M., Bauer, C.A., Richardson, B.D. 2010. The effect of supplemental dietary Taurine on Tinnitus and auditory discrimination in an animal model. Hearing research 270, 71-80. Maya Vetencourt, J.F., Sale, A., Viegi, A., Baroncelli, L., De Pasquale, R., O’Leary, O.F., Castren, E., Maffei, L. 2008. The antidepressant fluoxetine restores plasticity in the adult visual cortex. Science 320, 385-8. 3. Sound Therapy plus Therapies That Enhance Plasticity Norena, A.J., Mulders, W.H., Robertson, D. 2015. Suppression of putative tinnitus-related activity by extra-cochlear electrical stimulation. J Neurophysiol 113, 132-43. Yameen, F., Shahbaz, N.N., Hasan, Y., Fauz, R., Abdullah, M. 2011. Efficacy of transcutaneous electrical nerve stimulation and its different modes in patients with trigeminal neuralgia. J Pak Med Assoc 61, 437-9. You are giving us hope. Please dont stop your effort, you are God for a lot of people suffering of this condition. Thanks. I hoped to find something about Keppra here cause It’s often discussed in T and H forums. Also no word about Potassium Channel Openers. Would be interessting to know if they could help with h.
Thank you for all your hard work, effort and heart that goes into trying to find out a cure for a lesser known condition. Your work and care brings much encouragement to those of us who suffer with this and just want to lead a normal life. I thank God for people like you. Please keep up the efforts, it is not thankless to those who have this condition!!!! !